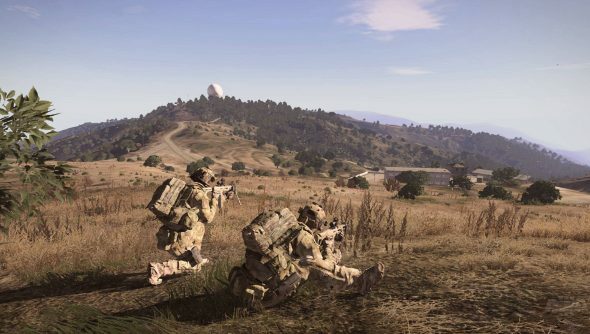 Bohemia Interactive revealed plans to develop an expansion for it’s military sandbox, Arma III. The unnamed expansion will not be a standalone, and has is expected to launch sometime in 2015. “We’re at a stage of development where we want to take some risks, experiment, and innovate! With that in mind, the exact scope of our work will, for now, stay dark and will remain so until we’re a bit more confident about what we can truly deliver,” said Arma 3’s creative cirector Jay Crowe and project lead Joris-Jan van ‘t Land. Further along is Arma 3’s premium DLC content, with two mini-expansions in the works. Arma 3 Helicopters will, unsurprisingly, add more depth to the helicopter experience. It won’t just benefit pilots, though. Bohemia Interactive wants the changes to helicopters to affect the rest of the game and all players. “To achieve this goal, we’ve sought to create new mechanics that enhance the combined arms experience and improve the A3 platform more broadly” Crowe and van ‘t Land said. “Although at an early stage of development, we’re looking specifically at the logistical role of helicopters on the battlefield (via Sling Loading) and thinking about gameplay for soldiers in transit (via Firing from Vehicles).” The Helicopters DLC is due out in the second half of 2014. Arma 3 Marksmen is an overhaul of shooting mechanics that adds a selection of new weapons. “The central goal of this development is to make firing a weapon simple to do but challenging to master,” they said. This is due out after the Helicopter DLC and is still under wraps. Along with the DLC and expansion, Arma 3’s Workshop support and launcher are getting tweaked. Add on support will be extended, as will the functionality of the launcher as a mod manager. A boot camp tutorial is also planned.